The Western Rim Connector is in the Utah Rims Area along the Colorado/Utah border west of Grand Junction, Colorado. 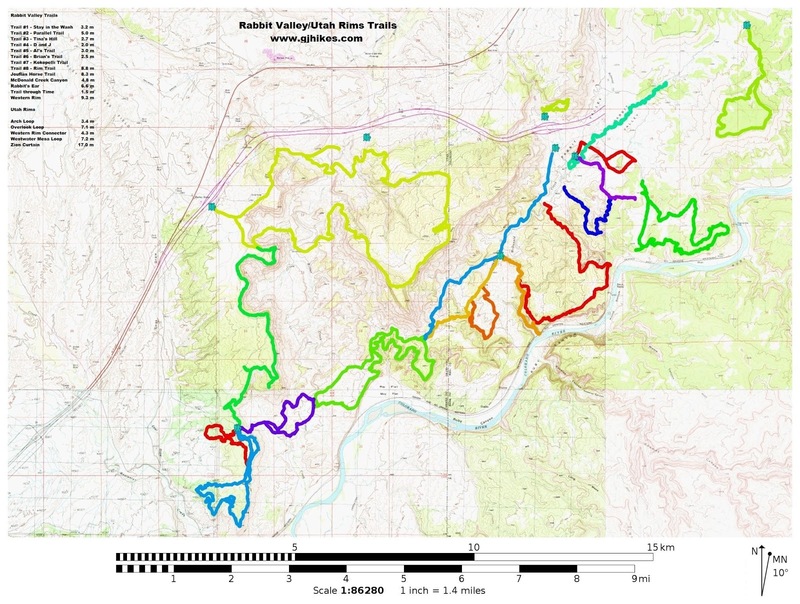 The connecting trail provides an alternate access route to the popular Western Rim trail that is most often reached from various trailheads in the Rabbit Valley Area. Trail users have the option of following a double track the entire distance to the Western Rim or splitting off onto a singletrack trail which takes a more scenic yet somewhat challenging route. 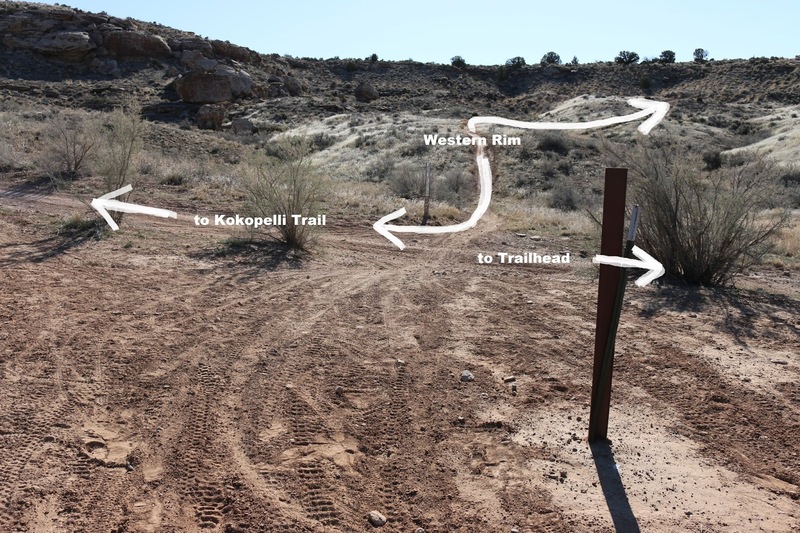 For this post we are beginning at an unimproved trailhead that is located where the Kokopelli trail meets the Westwater Road. To get there take Exit 227 on Interstate 70 and follow the paved road south for 3.5 miles. 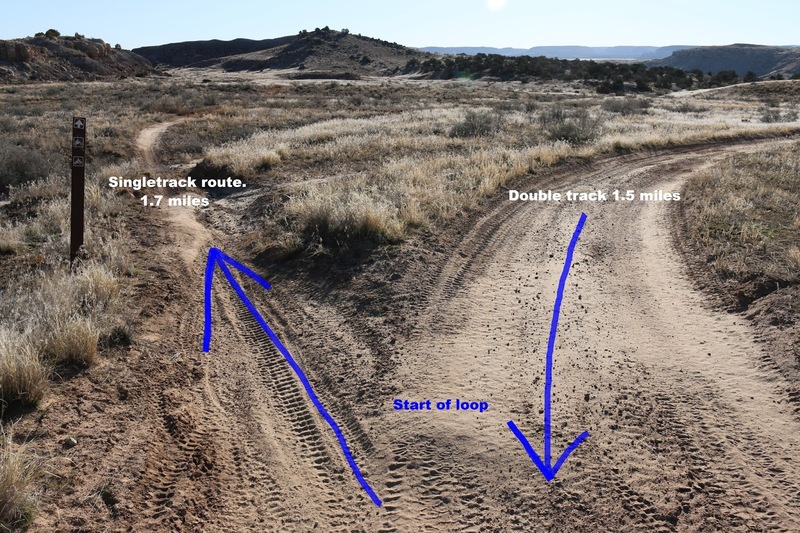 At that point the Kokopelli Trail makes a junction with the paved road. Passenger cars will need to park here and either hike or bike the remaining 1.7 miles to Westwater Mesa. Moderate to high clearance vehicles can continue past the kiosk and drive 0.9 miles where another road departs on the right. Follow the right fork for 0.8 miles to the unofficial trailhead in this photo. There are a few spots that are a little rocky and one that requires more clearance than most passenger cars will have. In anything other than the best of conditions a 4-wheel drive may be needed to cross the washes and make it back up the hill on the trip out. If you happen to be on a mountain bike it is a quick ride to the trailhead and may even be faster than driving a vehicle. From Westwater Mesa follow the double track that heads down the east side of the ridge. 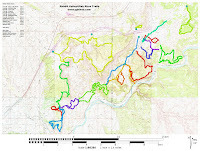 The Western Rim Connector is the only unmarked/unnamed trail. It is a big drop from the Westwater Mesa ridge to the floor of the valley. It gets pretty steep in places and loose rock can make braking precarious. Just past the half mile point a singletrack splits off from the road on the left. From here you have your choice of routes. The easiest of the two is to stay on the road and at the next intersection take a left up Bitter Creek to the Western Rim trail. 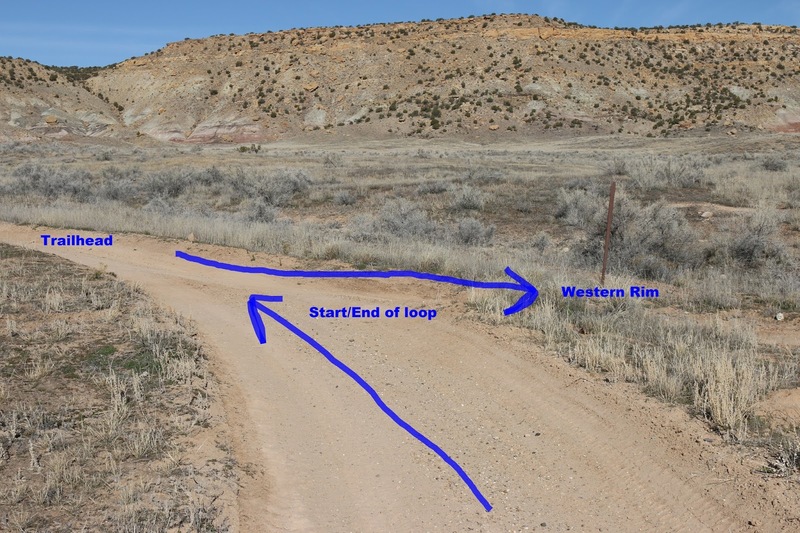 For this post we are taking the singletrack to get to the Western Rim trail and coming back along the road. The singletrack starts out following a mostly dirt trail that takes it through a wash. A rock shelf that is a couple of feet high presents itself on the climb after the wash. The climbing gets steeper as the trail makes its way up a rocky slope to reach a ridge. Once on the ridge it is an easy roll across a hogback with some nice scenery to enjoy along the way. The trail drops off the hogback and continues along an easy to moderate route as it traverses around the terrain. Eventually the trail begins dropping down from the bench area that it has was following. As the trail continues to get lower it crosses several washes in the final stretch to its junction with the Western Rim trail. The trail comes to a junction where the Western Rim singletrack is coming to an end. 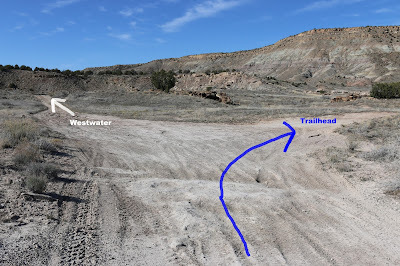 From here you can follow the Western Rim trail by either going straight and continuing on the singletrack or taking the left fork which leads a short distance to the Kokopelli trail. 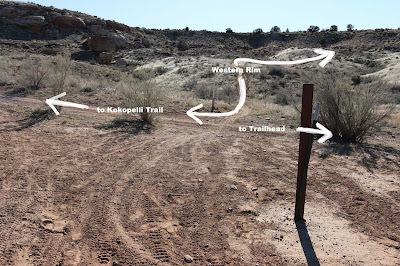 From there you can follow the Kokopelli trail toward Rabbit Valley and pick up the other end of the Western Rim trail. 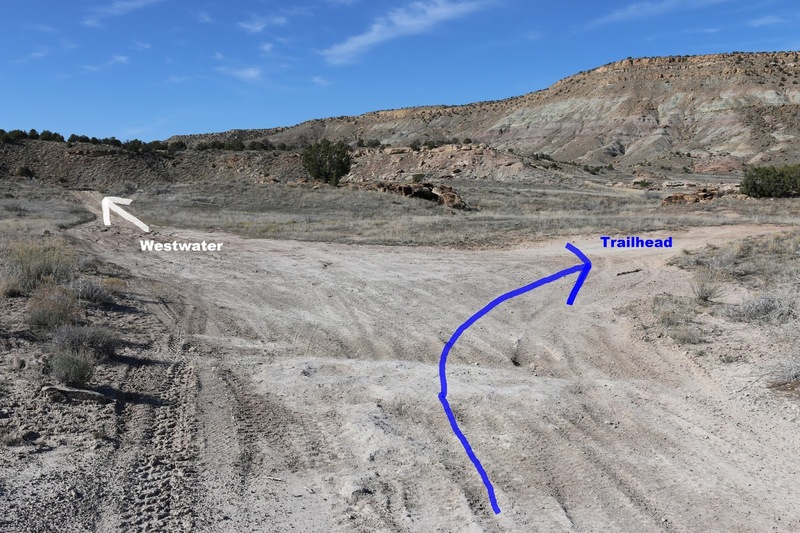 There is also the option to take the right fork which will lead back to the trailhead with another option of making a detour that loops around to Westwater. For this post we took the right fork that leads back to the trailhead. 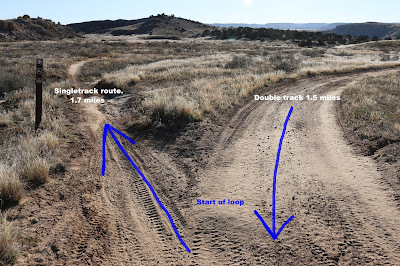 After about 9 tenths of a mile there is another intersection where the right fork continues looping back toward the trailhead and continuing straight ahead leads to Westwater. The prominent hill in the background of this photo is Westwater Mesa. After another 6 tenths of a mile the road reaches the point where the singletrack began and it is only a matter of retracing the route back up the mountain to the Westwater Mesa trailhead. We actually turned around at this point and went back to the last junction where we continued following the road down the Bitter Creek drainage to Westwater. From there we made our way back to the trailhead along the Kokopelli trail. The big loop that we followed came out to be 13.3 miles in length. 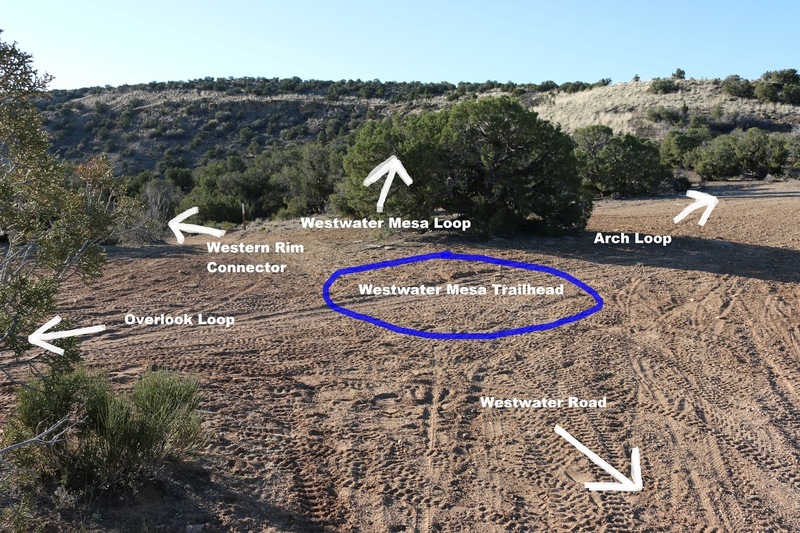 If you take the Western Rim Connector to the Western Rim trail and ride that loop the total round trip distance from the Westwater Mesa trailhead is about 12.5 miles and from the trailhead where the Kokopelli trail meets the paved road is 15.9 miles. There are plenty of options to choose from to find one that works for you. All of the various routes are also open to dirt bikes. If you would like to see it for yourself then all you have to do is grab your bike or 'Take a hike'.